It’s been a few months since Disney announced a land based upon Marvel super heroes would be replacing ‘a bug’s land’ at Disney California Adventure, and we haven’t heard any concrete details or official updates on the project since. In that announcement, the only details provided were that the Guardians of the Galaxy would be joined by Spider-Man and the Avengers in a completely immersive Super Hero universe, furthering the evolution of Disney California Adventure. To recap, “It’s Tough to Be a Bug” closed March 19, 2018 and that building will comprise a large portion of the first attraction to open in this Marvel land. The rest of ‘a bug’s land’ will close after the summer tourist season, and work is expected to begin shortly thereafter to meet the 2020 opening goal for the first phase of this project. We’ve received credible word that the Disney California Adventure land will be an Avengers campus set in real-world Southern California. It will be a place where Marvel super heroes can share their technology and methods of helping the world with the public. This super hero campus will feature two attractions (one in phase 1), two merchandise shops (one in phase 1), and a microbrewery/counter service restaurant all connected by a small quad space and various avenues. The phase one attraction will be a family-friendly, interactive 3D ride that will be an expansion of the existing ‘It’s Tough to Be a Bug’ theater. A large portion of the additional attraction space will be queue, which will abut the existing ‘a bug’s land’ restrooms (to remain and be updated). In addition to this attraction, there will be a number of “Heroic Encounter” meet & greets and entertainment offerings throughout the land, primarily in the central quad of the campus. Entertainment will apparently play a large role on the campus, as even one of the gift shops has a two-level performance space. Attraction-wise, I’m guessing the first ride will be a screen-heavy dark ride judging by the limited space of the show building, and I think that could work as the first, shoe-horned option. I wouldn’t be surprised if this is similar to the Ant-Man shooter game attraction being built at Hong Kong Disneyland (that’s HKDL concept art above), except perhaps with a different character (shooting Spider-Man webbing would be a good fit). That’s not at all part of this rumor, just a complete shot in the dark on my part. We have no updates on the long-rumored indoor Vekoma bike coaster. Given that the phase one attraction will be a family-friendly, interactive 3D ride, that’s certainly not going to be the first attraction. Whether that bike coaster is still coming in phase two or the second attraction is something different entirely remains to be seen–we have no further insight on that. The microbrewery is also an interesting choice for a Marvel land, and this location is fairly large. It appears the microbrewery will double as a counter service restaurant, and will act as something of a buffer between Guardians of the Galaxy – Mission: Breakout and the rest of the campus. It’s unclear what the conceit of this location will be, or the #story justification for getting people drunk in a place existing to teach people about helping the world, but whatever. Alcohol is high-margin, so of course it’s going to play a large role on campus. It’ll be interesting to see how, if at all, the setting will actually resemble SoCal. Will it just be lip service, with a futuristic design, or will the Imagineers draw from the Googie, Space Age, or Mid-century Modern locations that dot Southern California. Glendale-based Imagineers have demonstrated no timidity in drawing from real world locales in their own backyards with recent designs at Walt Disney World…will the same be true here? Personally, I have mixed feelings about this approach. Realistically, I don’t think there are any iconic environments in any Marvel films that could easily be replicated in a theme park. Sure, Wakanda and Asgard are cool, but getting those right in a park would be near-impossible without copious amounts of CGI, and neither are even remotely good fits in DCA. The Marvel setting of my mind is a New York City-like place, but nothing says that’s what it must be. Ultimately, this is something with which I’m willing to take a wait and see approach. If Imagineering creates some eye-catching architecture that evokes Southern California and is akin to the creative campuses around the region (including several belonging to Disney! ), I think this could work. The prize for this giveaway is a box of items from all over Japan. 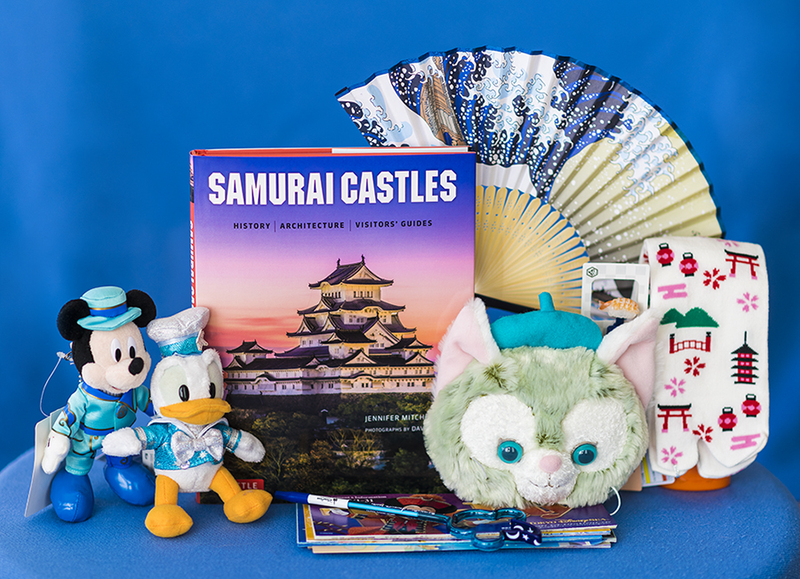 Inside, you’ll find a Gelatoni coin purse exclusive to Tokyo DisneySea, folding fan with classic Hokusai art, Samurai Castles hardcover book, Japanese sushi ink pen, temple socks, Tokyo Disneyland Mickey & Donald character plush badges, WDI Sorcerer Mickey pen, and park maps. This giveaway is being “co-sponsored” by DisneyTouristBlog and our non-Disney travel blog, TravelCaffeine.com to celebrate publishing our Ultimate Guide to Kyoto and our Ultimate Tokyo City Guide, which along with the resources here, provide an excellent foundation for what you need to know if you’re planning a trip to see Tokyo Disney Resort and the highlights of Japan. Comment on Any Blog Post on TravelCaffeine. Commenting on this post is not an entry. Please be sure to read the instructions for each giveaway entry method and then verify it in the giveaway form above. Good luck in the giveaway! What do you think of the Avengers Southern California Campus? Is this an interesting and workable conceit for a Marvel Land at DCA, or would you prefer something else? Thoughts on the rides, microbrewery, gift shops, or anything else? Any questions? Hearing your feedback is both interesting to us and helpful to other readers, so please share your thoughts or questions below in the comments! I’m thinking the most iconic LA location in the Marvel Universe is Tony Stark’s home. Maybe they will tie that into a Stark Expo setting. Wondering what happened to the swinging arm patent technology rumored for a Spider-Man attraction. I don’t hate the idea of this, but is Mission: Breakout! going to be included in this California Campus land? I thought the collector’s tower was supposed to be in outer space so I am confused about how it would go along with a campus. I think it’s a fun ride, but they are going to have a hard time fitting into any area thematically. It’s not set in space. In the grand opening debut of the ride it is stated that the Collector brought his tower to Earth “to enlighten our species”. I’m still bummed by the closure of bug’s land (not the theater – I don’t think I’ve ever been in that thing). I know the rides were ridiculously unimaginative, but it was nicely located as a place to keep the kids entertained while doing child swap for the big e-ticket attractions. There’s not much else to do with young kids in DCA unless you want to ride Ariel or the carousel over and over and over. If Stark Industries existed in real-life, absolutely it would have a tech-campus somewhere in Silicon Valley. A StarkTech theme makes sense, and automatically includes both Iron Man and Spider-Man and could easily be expanded to include other MCU “technologies” like Pym-particles and Wakandan vibranium. It’s an easy way to combine many MCU characters into a California theme, and at the very least makes for a more cohesive park identity than a bug’s land did. I also think “Super Hero Campus” is only half of what’s planned for Marvel characters at DCA. While the former bug’s land will be home to StarkTech and MCU’s Earth-based heroes, there’ll be a second themed-land in what’s currently the staff parking lot behind Misson:Breakout, which will be themed to one of the outer space locales in the MCU and be home to Marvel’s space-based heroes including the Guardians. It’ll likely include an Avengers coaster which will use the same ride system as the Guardians of the Galaxy coaster currently under construction at Epcot and possibly another ride themed to Thor or Captain Marvel. This second-area obviously won’t open until after Phase 2 of “Super-Hero Campus” opens. As for the rumours about the Vekoma bike-coaster? I don’t think that’s going to happen. The rumours were that it was going to be themed to Captain America, but I don’t see how that’ll fit in with what currently exists and has been announced. Also, the rumours were leaked before the GotG coaster at Epcot began construction, and it’s seems likely to me now that whatever plans did exist for it have been replaced with that other ride system. Of course, I’m not an insider, what the hell do I know? What you’re describing is certainly plausible, as phase 2 of this project does not touch the parking lot behind Mission: Breakout. However, what are the chances Disney actually does a three phase project? Quite often, the second phase of projects falls through, so I’m a bit skeptical that we’d see 3 phases here–at least in the near to mid-term future. The bike coaster makes sense to me, as it would mean they could copy the Tron Coaster ride system. Captain America often rides the bike into battle, and they could theme it around that. With him, you can even introduce some sort of time travel element, where you get sent back to fight with Red Skull in the 40s. That lets them side step any “events” that may happen to Chris Evans version of CA in upcoming movies. Why can’t they use the word “Marvel” in the land’s name? Because of the licensing deal that Universal Studios made with Marvel Comics back in the 1990s. Universal has exclusive theme park rights to the characters in Japan and east of the Mississippi, however it has exclusive theme park rights to name “Marvel” across the United States. This means Disney can use Marvel characters at their California parks, but they can’t use the name “Marvel” in any official capacity. “Personally, I have mixed feelings about this approach. Realistically, I don’t think there are any iconic environments in any Marvel films that could easily be replicated in a theme park.” Exactly! I’m pleased to hear that the area will not be self-aware about its theme park location. I dislike that aspect of Guardians (and now the incredicoaster as well) as it seems like lazy story telling to me. Thanks for sharing this rumour, there has been such a shortage of information! I wouldn’t be too enthusiastic. The ‘not self-aware’ aspect of the land refers to it on a high level, and only means that it won’t have an explicit storyline of super heroes visiting a theme park. I wouldn’t be surprised if there are corny instances of breaking the fourth wall a la both of those attractions. I think the manatees have quit writing Family Guy and have taken control of Disney’s park planning. The only way to explain many of the announcements from the last few years onward. Although I love the idea of a microbrewery. Nothing screams “helping the world with the public” more than opening up a microbrewery.